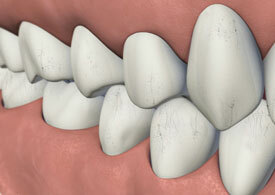 One of the most common reasons for tooth pain is the existence of a crack or fracture. Cracked teeth demonstrate many types of symptoms, including pain when chewing, temperature sensitivities, or even the release of biting pressure. It is also common for pain to come and go, making it difficult to diagnose the cause of discomfort. We see many patients each month at New England Endodontic Solutions for evaluation and treatment because a crack has been diagnosed or suspected. Endodontic treatment is often the first step in the attempt to return a tooth to comfort and function. When the outer enamel of a tooth is cracked, chewing causes micromovements of the pieces, and the dental pulp can become irritated. When the biting pressure is released, the crack can close quickly, resulting in a momentary, sharp pain. With time, the pulp will become damaged to the point that it is severely inflamed or will start to die. The tooth will not only hurt to pressure but will become sensitive to hot and/or cold. Cracks can lead to infection of the pulp tissue and ultimately to the surrounding gum and bone. Endodontic (root canal) treatment removes the injured pulp and helps heal the infection caused by the damaged or dying pulp. Unfortunately, unlike a broken bone, the fracture in a cracked tooth will never mend. Endodontic treatment cannot seal or fuse the crack, and in time, in spite of treatment, some cracks may continue to progress and separate, resulting in need for extraction (loss of the tooth) and if possible or indicated, replacement. Even with high magnification and special lighting, it is often difficult to determine the exact extent of a cack. The crack is almost never visible on conventional dental radiographic film or digitial radiography. Because of the uncertainties involved, the doctor will discuss with you the overall prognosis of your case (usually 70-75%). Please remember that once treated with endodontic therapy and a crown, most teeth continue to function and provide years of comfortable chewing. There is no perfect substitute for your natural tooth. When a cusp becomes weakened, a fracture may result. The cusp may break off or be removed by a dentist. 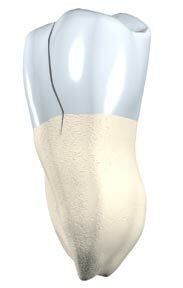 A fractured cusp rarely damages the pulp, so root canal treatment is often unnecessary. Your dentist will usually restore the tooth with a full crown.